The cabinet gets a 12-month immunity to implement its programme. 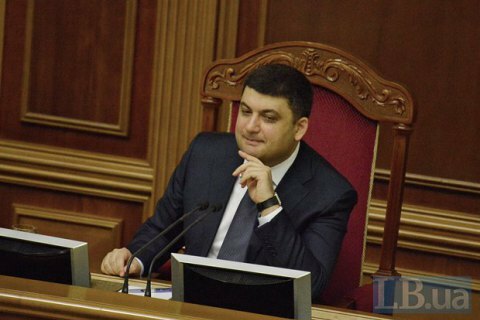 The Ukrainian parliament has at the third attempt approved the programme of the new Cabinet of Ministers headed by Volodymyr Hroysman. It was supported by 243 MPs during the parliamentary session on Thursday, 14 April. The earlier attempts failed garnering only 214 and 222 votes. During the presentation of his programme, Hroysman said it was based on the previous tasks of the coalition agreement. He also promised to flesh out within a month a "clear-cut action plan" for the rest of 2016. He pledged to demonstrate "tough management" as head of the government. Under the law on the Cabinet of Ministers, it becomes immune from dismissal for a year after its action plan is approved by parliament.